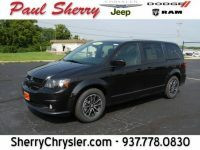 Paul Sherry Chrysler Dodge Jeep RAM wants to be your Dodge Dealer of choice! We proudly serve Dayton, Piqua, Sidney, Troy, Greenville and the rest of the Miami Valley with the very best price on new Dodge vehicles. As with all of our models, you will find our Dodge vehicles listed with the lowest prices in the area thanks to our efforts to find every applicable discount and incentive for you. We are in Piqua and are proud to be the highest-rated Dodge dealer within Dayton. We’ve worked hard to earn that reputation through reasonable pricing and attentive customer service. Our Dodge dealership lineup includes a wide range of body styles, and you can find them all at Paul Sherry Chrysler Dodge Jeep RAM. Pick the Dodge Charger, Challenger, or Dart if you want a sedan with or without sporty styling. Pick the Viper for that sports car experience. The Journey and Durango offer two unique SUV options of different sizes so you can get as much space as you need. The Grand Caravan minivan is perfect for families. Our Dayton Area Dodge Dealership honors all discounts and incentives while making every effort to provide complete information about each vehicle. This way you know you are getting the very best deal! Some incentives include $500 Military bonus cash, Automobility Disability Assistance, and more! Please contact our highly rated team so we can provide the service you deserve! At Paul Sherry, we let everyone apply for an auto loan. You may qualify even if you have bad credit, and we offer great deals to those with good credit. Even if you don’t have credit, you won’t have to worry. Our finance team works with various car loan companies to ensure we offer our customers a range of financing options regardless of their state of credit. This way, you can rest assured knowing that you are getting the best deal from any Dayton Area Dodge dealer, and can find a vehicle that meets your budget.